The true communion between souls. A place where the world comes back together again. A small piece of the earth on Galiano Island,BC for mutual nurturing. We are humanitarian - we are feeding each other. We acknowledge that we consume/participate in the world and that we are also consumed/participated by it. We acknowledge that we are one, but not the same, and we get to carry each other. Communitas is a place for Being with all beings, for serenity, for sharing ourselves and for recharging. 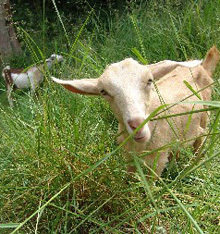 We share ourselves here with goats, dogs, cats, chickens, the trees, rocks, ocean and beaches and the greater community. The food we share is organical, some grown from the Communitas garden, some from wider	sources as local as possible focused mainly in plants, legumes and grains enhanced by the Communitas animal contributions. Council and Heart Circles are held regularly and sacred speech is practiced daily. Yoga starts most of our days which are coloured with group or individual pro-jectory input, stewardship of the land and animals, musical jams and quiet times. We practice nurturing imagination, desire and expectancy, not expectation. The soul of the land loves to be sung to just as our own souls long to be sung, danced, cried and celebrated into the world. And we do. You are well come for a short visit to bring your world back together again, to breathe, or to contribute a longer stay based on space availability. Please let us know when you would like to come.